"Pillows causing back pain? Really?" I know, it may seem like a strange thing to suggest. Because pillows are soft and fluffy right? So how are they going to cause you any damage? The only pillow-induced damage I could think of at first was my memories of having pillow fights as a kid. And anyone that has caught an unexpected and well-timed swing of a pillow flush in the chops may start to question the soft and fluffy theory. Especially if the blow was accompanied by a rogue piece of pillow case simultaneously whipping into your eye. Luckily for me, being the eldest child in my family by four years these instances were few and far between (although I can't say the same for my younger brother!). But believe it or not even as an adult your pillow may be causing you damage and you probably don't even realise it. As those aches and pains that you wake up with in your back, neck, and shoulders may in part be down to the type of pillow you are using. So to avoid this you need to get the right pillow that supports your neck and keeps your spine in alignment. And this changes depending on your sleeping position. 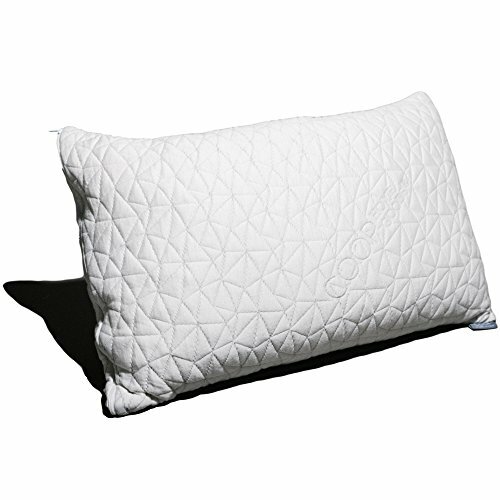 Best pillow for back sleepers - Coops Home Goods Adjustable Memory Foam Pillow. 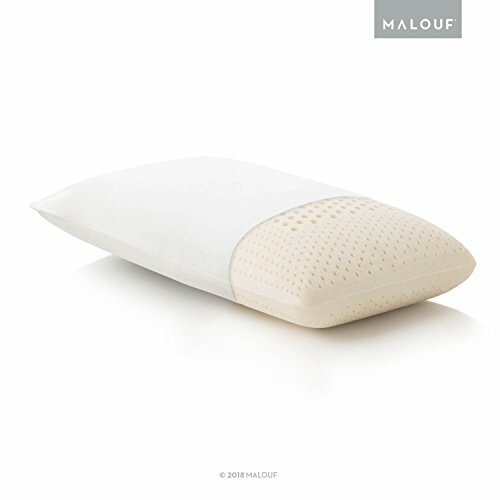 Best pillow for side sleepers - Malouf Z Zoned Talalay Latex Pillow. Best pillow for stomach sleepers - eLuxurySupply Down Filled Pillow. Best pillow for combination sleepers - Saatva Pillow. Now there are many factors at play when it comes to working out why you suffer from back, neck, and shoulder pain during sleep. For example, you may have been stressed at work or overdoing it from an exercise point of view. On the flip side maybe you've been underdoing it and need to get more active﻿. Or maybe you're sleeping on the wrong type of mattress, or one that is too old and needs replacing. Now all of these things can be valid causes of your back pain and need to be looked at. However, one thing that often gets overlooked is if you're using the correct pillow or not. Well consider that your head weighs about the same ​as a bowling ball. And if you have a pillow that doesn't support your neck properly then this weight will pull your cervical spine out of alignment as you sleep. Which will put a massive strain on your neck and shoulder muscles as they will have to pick up the slack for this lack of support. And your spine being out of alignment will also place added pressure onto your body, especially your back. So the pillow you use is a vital part of whether you can sleep through the night pain free or not. Because it can provide support and keep your neck and spine in alignment. Which allows the muscles that support your head throughout the day to relax, making sleep a whole more comfortable experience. ​Therefore you really need to make sure you are using the right pillow. And to do this you need to get one that suits your preferred sleeping position. Sleeping on your back can be a pretty good position for people with back pain. This is because your back remains straight and aligned throughout the night. However, to keep this alignment you need to make sure you have a pillow that allows your head to remain at the right height. As a pillow that forces your head to sit too far forward will put your neck in an unnatural position. Which will place a strain on your neck, shoulders and lower back. And if your pillow is too low it can strain your neck muscles, as they have to work against the weight of your head tilting backwards all night. So ideally you want a pillow with a loft that will keep the natural curve of your cervical spine in place. And this will need to have a medium level of firmness and support so your head sinks in a little but not too far. 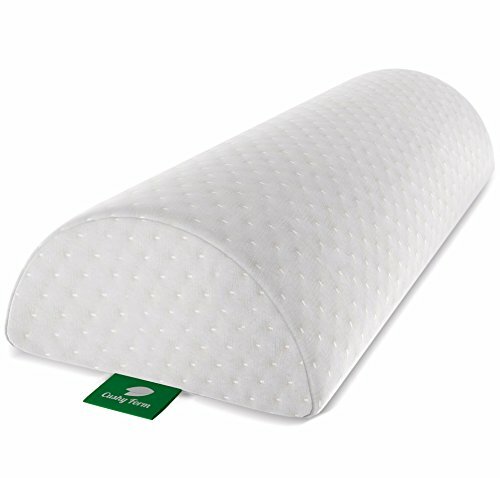 So one pillow I'd recommend for back sleepers is the Coops Home Goods Adjustable Memory Foam Pillow. ​This one is a good choice because you can adjust it so it's the perfect height for you. As it's filled with pieces of shredded memory foam that combine to create a pillow that molds to the contours of your head and neck as you lay on it. Which makes it a really comfortable choice. And to get it to be the right height you simply​ add or remove pieces of the memory foam. This is great because the height of a pillow that you need will vary slightly depending on how soft/firm your mattress is and the weight of your head. So to be able to tailor a pillow to your exact requirements​ can solve this headache. Another way you can reduce back pain if you sleep on your back is to place a pillow underneath your knees. As this will flatten the arch in your spine that is created by laying on your back. And by doing this you will take pressure off your facet joints and lower back, reducing the strain on your body as you sleep. So a great choice for this is the Cushy Form Half-Moon Wedge Pillow. This pillow is perfect for placing under your knees to relieve the pressure on your lower back. And as it's made of a memory foam layer on top of a supportive foam layer it won't go flat over time either. Sleeping on your side is the most popular sleeping position and can help to relieve pressure on your back when you do it right. So how can you make sure you are doing it correctly? Firstly, your head needs a higher, thicker, and firmer pillow in this position to support it and keep your neck and spine in a natural alignment. And for this reason latex pillows are a good option for side sleepers. This is because they are firm and don't allow you to sink in to them too much, pushing back against you to provide support for your neck. And a good latex pillow that I'd recommend for side sleepers is the Malouf Z Zoned Talalay Latex Pillow. As it has great support and even has zones with different levels of support within it. So your head is cradled while your neck is supported, making it more comfortable to sleep on. And this pillow comes in a few different variations so you can choose the height and firmness to suit you. For side sleepers I'd recommend you choose the high loft and firm version. Although if you prefer a softer sleeping experience then the plush may suit you better (but stick to the high loft if you sleep on your side as you need this height). While getting the right head pillow is vital for side sleepers, you also need to keep the rest of your body in alignment too. As sleeping on your side with your knees up in the foetal position is great for relieving pressure on your joints and spine. The problem is people have the tendency to get into bad habits while sleeping this way. For instance, it's easy for your top leg or shoulder to push forward and over the bottom one. And this forces your spine into an unnatural position which can lead to aches and pains when you wake up in the morning. And the best way to do this is to place a firm pillow between your knees, which will keep your spine and pelvis in a neutral position. This will also relieve any sciatic pain and take the pressure off your lower back. 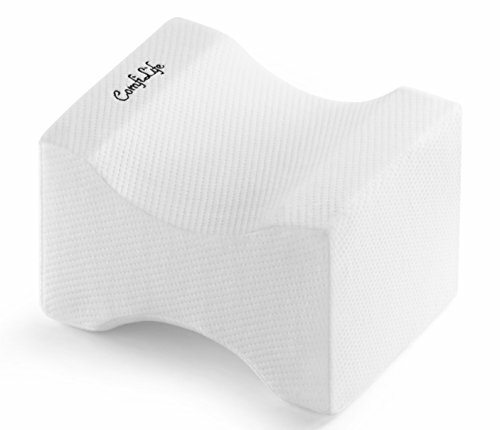 So if you want a good knee pillow check out the ComfiLife Orthopedic Knee Pillow. As this one is made of high density memory foam which will feel comfortable but also keep your legs, hips, and spine in alignment as you sleep. And if you want to go the whole hog you could buy a full body pillow to cuddle up to instead.. These are usually shaped like a U or a J and run the length of your body to keep you in a neutral position throughout the night. This will relieve pressure not just on your back, but on your neck, shoulders, pelvis, and hips as well. And another advantage of one of these is that they are supremely comfortable to sleep with. And this will help your body to relax and get into a deeper sleep, allowing your muscles to heal and repair themselves. So if you miss cuddling up to a teddy bear at night like you did as a kid, then a full body pillow could be an option for you! Sleeping on your stomach can be a useful sleeping position for people recovering from spinal surgery and those suffering from certain spinal conditions. However, in general it's not a great position for your back. This is because your back sinks and flattens when you lay on your stomach, which leaves it unsupported and under stress. And your neck has to rotate out to the side so you can breath during the night, which throws you out of alignment. But the problem for regular stomach sleepers is that changing sleeping positions is difficult. And you might even ​enjoy sleeping this way. So, if you are a stomach sleeper that doesn't want to change, there are a couple of minor adjustments you can make that will reduce any back pain you experience. Firstly, you need to be sleeping on a pillow that is very soft and thin and allows your head to get almost flat to the mattress. And one I'd recommend is the eLuxurySupply Down Filled Pillow. This is a good choice because it has been designed specifically for stomach sleepers. Firstly it's filled with goose down and feathers, making it extremely soft and comfortable. So much so that your head will sink right into it, which is exactly what you want as a stomach sleeper. And once you have a pillow for your head sorted out, you can also benefit by placing a similarly flat and soft pillow underneath your pelvis. As this stops your back from flattening out, which will help you to maintain a natural alignment and reduce any pressure on your lower back. So buy two of these pillows, one for each purpose! Now not everyone will settle into just one position as they sleep. 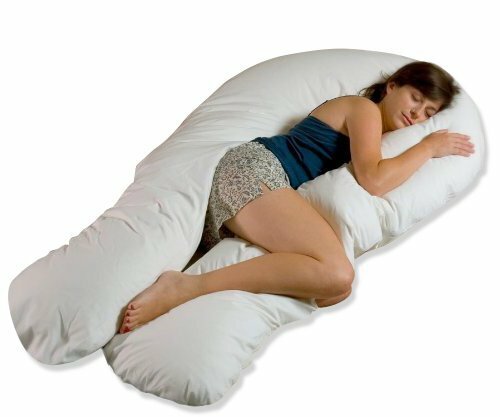 And if you're one of those that end up sleeping in multiple positions during the night, then you need a pillow that can accommodate this. So look for a multi-tasker that can adapt to a combination of sleeping positions and keep you comfortable and aligned in each one. A good filling to go for in these pillows is shredded latex, as this will mold to allow your head to sink in to it whichever position you are in, but not far. And the push back of the latex keeps your neck supported and your spine in alignment, which will relieve pressure on your body as you sleep. Now these latex pillows are usually a little more expensive than regular ones, but they can be the perfect fit for any restless sleeper. And a good one to test out is the Saatva Pillow, as you can try it for 45 days and return it if it doesn't suit you. I hope that this article has given you some ideas on how you can improve your sleeping experience and minimise any aches and pains in the mornings. As while using the right pillow sounds like the least important consideration, it's vital for reducing your back, neck, and shoulder pain. And all of the pillows I've recommended here will put you on the right track to a pain-free nights sleep. Just make sure you get the one that suits your preferred sleeping position. 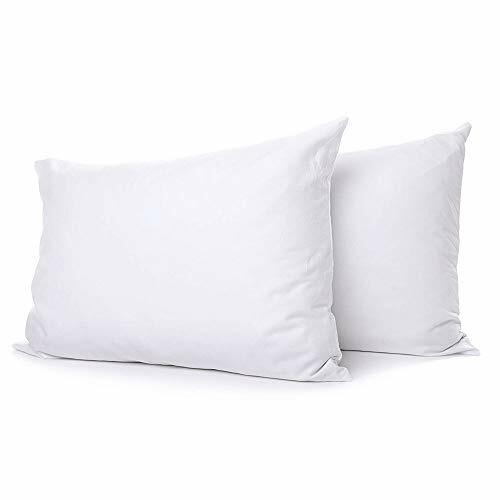 And if you want to know the best pillow for a pillow fight, I'd recommend a thin, firm and smelly one with an over-sized and straggly pillow case.